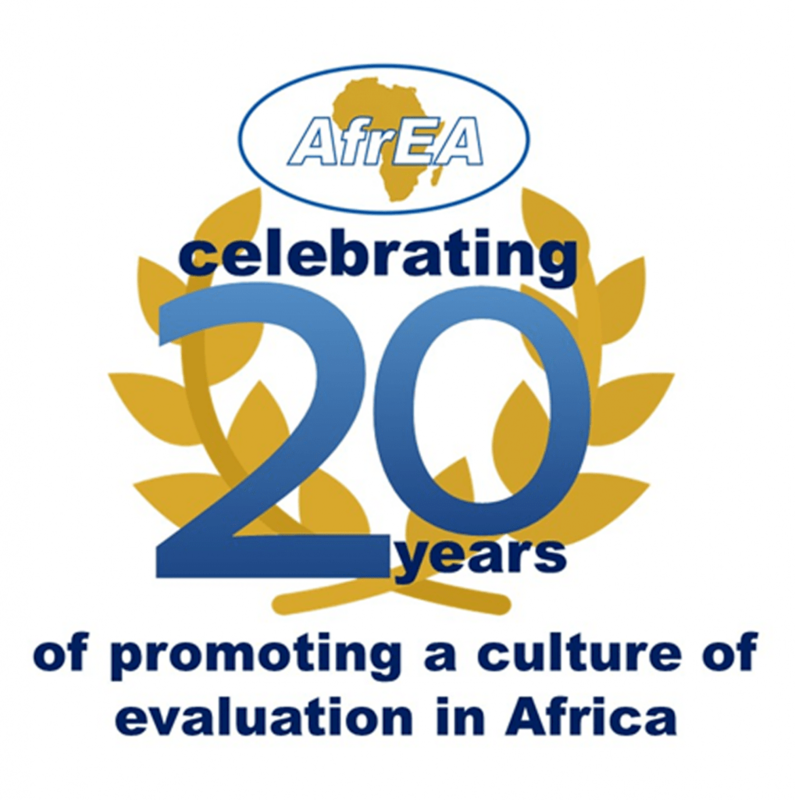 The African Evaluation Association (AfrEA) was founded in 1999 and today, 15 March 2019, marks the 20th anniversary of its establishment. AfrEA has been spearheading the strengthening of evaluation culture and practice in Africa for the past two decades. We, the members of AfrEA acknowledge and appreciate the tremendous work done by our presidents, boards, member voluntary associations, institutions and individuals, and other partners in fulfilment of the aims of AfrEA. We, the members of AfrEA solemnly reaffirm and declare our commitment in the coming years to enable our members comprising of individual evaluators, national evaluation associations, institutions, networks and partners to debate, analyse, disseminate and make constructive use of evaluation information, products and services for the betterment of Africa and the global community. a. Building on the Call to Action issued at the 8th AfrEA Conference, held in Uganda in 2017, we as evaluators note modest progress on mainstreaming gender and addressing equity in the field of evaluation, as through publications, trainings and partnerships by AGDEN, EvalGender+, UN Women, Community of Evaluators (South Asia) and others. We further note that the ongoing efforts to revise and update the OECD/DAC criteria for evaluation have included gender and equity although not fully incorporated among the draft criteria. The time to correct this gap, and ensure that the evaluation field is relevant to the principle of “No one left behind” is now during the SDG era for the future by going beyond mere gender disaggregation of data. b)We highlight to all those present at this AfrEA conference the findings of a gender audit of our own evaluation work presented in this conference. Sampling 52 of the 651 accepted submissions at AfrEA-9 across all strands, a rapid gender audit found 13% of papers scored 0 on standard gender and equity evaluation criteria, and only 15% scored 8 or higher, on a scale of 0-10 based on UNEG criteria. The majority of presentations scored in the lower half of standardized criteria. This gender audit illustrates the progress we have made and the distance we as the evaluation community must still travel to fulfil our commitments made at AfrEA 8 and at other international events. c) Accordingly, we are launching at this AfrEA Conference a Global Campaign for Gender Equality and Social Equity in Evaluation. We expect each evaluator and organization representing a constituency, including AfrEA and other national and regional VOPEs, to define and commit to specific actions to advance gender and equity in evaluation. We as an evaluation community are calling on all evaluators to integrate gender and equity dimensions into all evaluations, regardless of sector, scope or purpose. Any time we evaluators ignore the inequities that permeate societies, evaluation fails to achieve its purpose. Support the establishment and growth of national evaluation associations in Africa. Promote the “Made in Africa evaluation” philosophy and recommit to the cultural specificity and diversity of the African history, context and contribution to global knowledge and civilization. Encourage the development and documentation of high quality evaluation practice and theory. Enhance evaluation scholarship and authorship by producing the African evaluation journal. Promote professionalism and individual capacities of African evaluators. Promote the development and use of the African evaluation standards and guidelines. Strengthen collaboration between national evaluation associations, national governments, research and academic institutions as well as think tanks and development practitioners to advance evaluation in Africa. ● 10. Promote gender- and equity- focused evaluations. ● 12. Measure, document and continuously improve performance of AfrEA and the national associations towards fulfilment of these commitments.